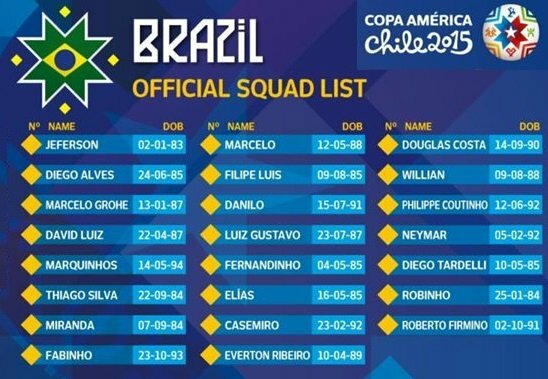 Brazil announced their 23 man squad for the upcoming South America regional international competition called Copa America which will be starting on 11 June 2015 where a 16 teams will be participating this summer. Chelsea midfielder Oscar missed out from the final squad while the full list of 23 players are placed below. Some of the outcasts like Robinho and Fernandinho made their way into the starting line and players like Oscar, Kaka has been left out of the team. Brazil coach Dunga announced quite a few surprises and some bold decision of selecting players from less popular leagues such as hotshot of Chinese super league players Diego Tardelli who plays for Shendong Luneng in China as well as “Everton Ribeiro” who is playing his trade in UAE team Al-Ahli since last year. Brazil are placed in Group C which also feature Coloumbia, VENEZUELA and Peru. Copa America will be starting on 11 June 2015 and you can find the complete schedule of the competition.